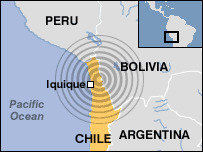 A 6.1-magnitude quake has hit northern Chile close to the border with Bolivia, the US Geological Survey reports. The tremor, whose epicentre was 145km (90 miles) east of the coastal city of Iquique, struck at a depth of more than 120km (74 miles), it adds. Chile's national emergency bureau (Onemi) said there had so far been no reports of damage, disruption to the power supply, or casualties. Chile lies in one of the most seismically active areas of the world. In 1960, it suffered the world's largest recorded earthquake which resulted in thousands of deaths. Monday's earthquake struck an area where many large copper mines are located. Chile is the biggest copper producer in the world, accounting for one third of the total production. Miners at the Collahuasi copper mine said they had felt the tremor at around 1630 (2030 GMT), but said it had not caused any damage. Mining at the Peru's Toquepala mine close to the Chilean border was also not affected. "For the moment, we have no reports of damage or power disruptions," an official at Onemi told the Reuters news agency shortly after the earthquake. A 7.8-magnitude tremor in June 2005 close to Monday's epicentre killed 11 people and left thousands homeless.